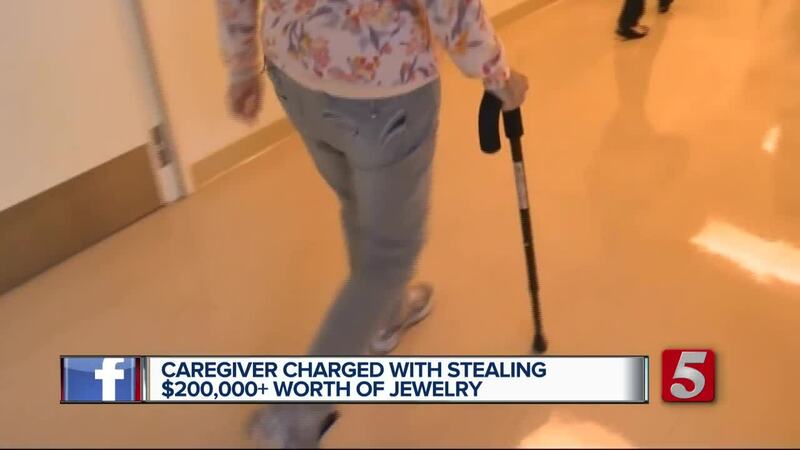 A Nashville caregiver was charged with theft Thursday, after a police investigation revealed she allegedly stole more than $240,000 worth of jewelry from an elderly man. According to her arrest affidavit, Ida Thomas worked as a caregiver employed by Senior Helpers Incorporated. While working at the Richland Place Retirement Community, investigators said they determined she stole 38 pieces of jewelry from an elderly man's room. The jewelry was valued to be worth $243,000. Investigators said they were able to match the days the jewelry disappeared to the days that Thomas was in the victim's room. However, officers didn't get their break in the case until three of the pieces of jewelry, including the victim's wedding ring, were pawned in September and October. 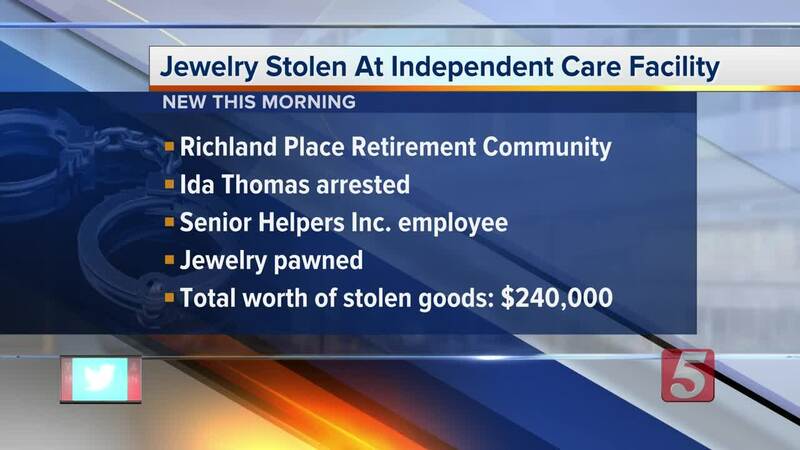 The shop reported it was Thomas who had pawned the items. Investigators showed family members the jewelry, and they confirmed to be some of the missing pieces. Thomas was booked into the Davidson County Jail and held on $80,000 bond. Senior Helpers Inc. said that Thomas had no previous criminal record, and they are fully cooperating with police and the family to ensure the most positive outcome possible in this situation. “It makes me furious. I often think there’s a special place in hell for people like that because they are taking advantage of vulnerable adults," Grace Smith, executive director of the Council on Aging in Middle Tennessee, said. Smith said you can never be too careful, the council constantly warn people of scams that could come their way, and they release a directory of services for seniors in Middle Tennessee that have been vetted. "Older adults are so frequently targeted by scammers and thieves, we recommend that you always do your homework before you bring someone into your home or hire an agency," Smith explained. In this situation, there was no telling that Thomas would commit a crime, as she had no criminal record, which is why Smith said it's important to be even more cautious. "Anytime you're bringing help into your home, you need to secure valuables, have them locked away, have a safe," Smith said, adding that the same should be done for important documents.